A cog in the corporate machine is about to strip some gears. 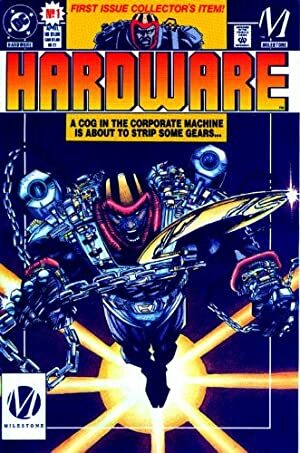 Hardware was one of the major characters of the Milestone imprint, operating in the original super-hero setting of Dakota City (and beyond). He appeared when the imprint launched, in 1993. 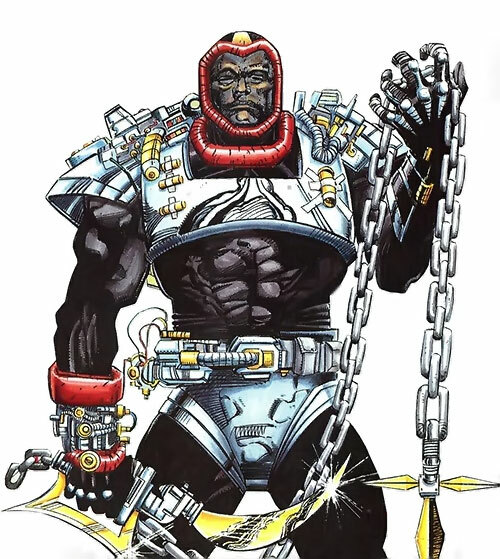 As a genius engineer with a one-of-a-kind power armour , he’s loosely comparable to Tony Stark or Steel (John Henry Irons). Real Name: Curtis “Curt” Metcalf. Known Relatives: Mitchell Metcalf (father), Denise Metcalf (mother). Base Of Operations: Dakota City. 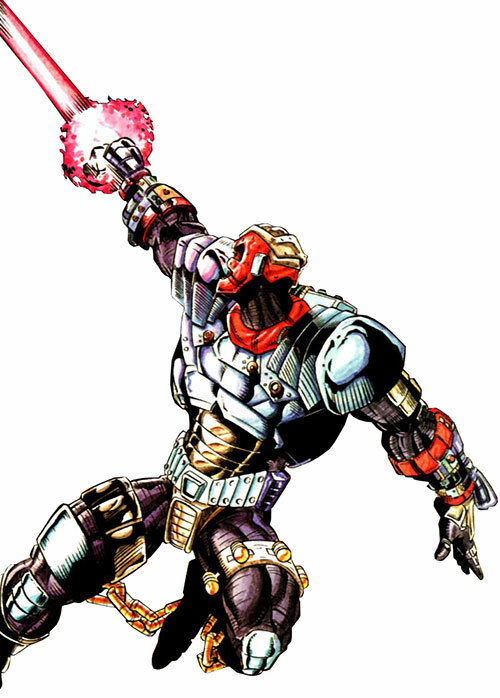 Height: 6’0” (unarmored), 6’6” (armoured) Weight: 180 lbs (unarmored), 860 lbs (armoured). Curtis is an above average athlete and a surprisingly capable hand to hand combatant. While it has never been revealed whether he has received formal training, he is also a skilled marksman. High tech armor and weapons systems. Later, Curtis reverse-engineered and repaired the communication and inertia winder technology from Icon’s life pod. Thus, he became Earth’s de-facto expert in Cooperative technology. To make matters worse, Curtis’s gift for innovation lends itself to his ability to craft plans and to create solutions to seemingly impossible problems on the spot. This makes him the ultimate “trickster” hero in the Milestone universe. Given enough time and/or resources, there is no situation too complex that Curtis cannot create a solution for. As Hardware, Curtis employs a cutting edge suit of body armor. It turns him into a one-man army. 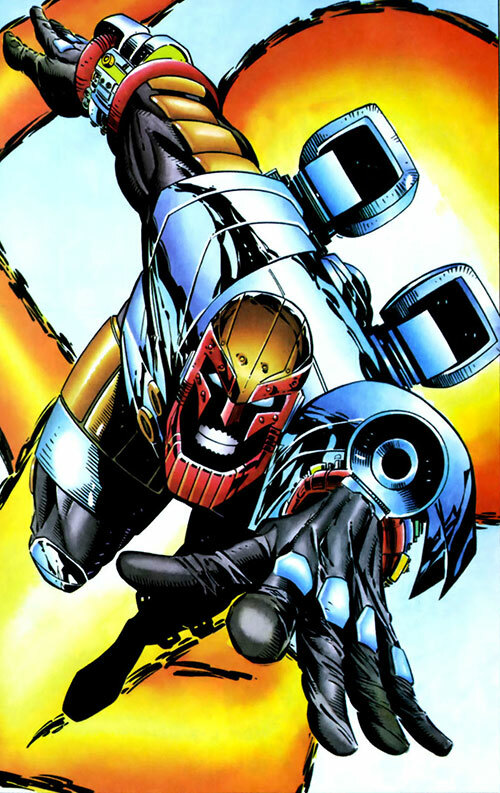 The armor contains offensive weaponry, which narrows the gap between Curt and his superhuman opponents. The Hardware armor itself is made up of two distinct layers of metallic alloys. The base layer is a jet black shell that is sprayed onto the entire surface of his body. It is constructed out of a polarized skintight, impact-resistant, plasticized metallic alloy that can relax and contract in nearly identical manner as human muscle but with greater force. Due to this property, the armor magnifies Curtis’ strength by 30 without dipping into the armour’s power reserves. If Curtis shunts his full auxiliary power into the armour’s strength augmentation, he can increase the armour’s strength magnification to 50. But every second that he does so comes with the risk of burning out the armour’s power supply. The armour’s secondary/external layer is created through the use of Cooperative nanotechnology. It is powered by highly efficient batteries that are stored within its shoulder pads. In addition, several million microscopic machines are housed within the armour’s shoulder pads. These are released when Curtis commands them to assemble the remaining components of the armor. The external armor layer is extremely durable and completely bullet proof. If the external layer is ever damaged, the nano-bots themselves can repair the damage in minutes. Targeting sub-system triggered by the wearers eye movements. Omni-Linguisitic communicator and translator based on Cooperative technology. The helmet’s chin assembly contains a speech synthesizer which digitally alters Curtis’s voice and gives it a cold, metallic quality. 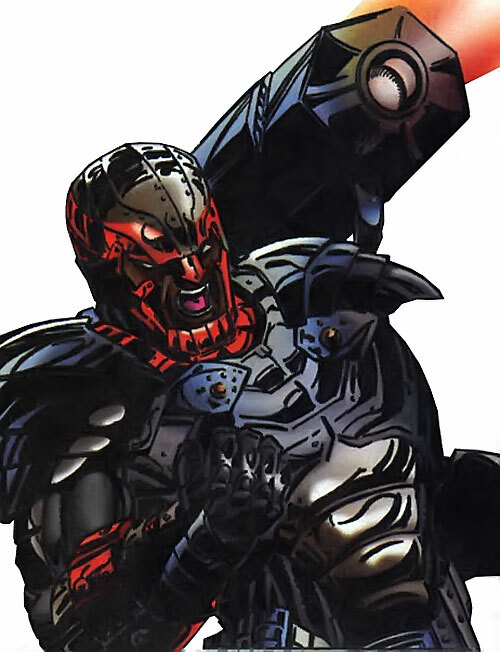 The Hardware armor is capable of extended flight through the use of a pair of external jet turbines. These are mounted behind the shoulder blades of armor. The jets can propel the armor at speeds around 400 mph for extended periods of time. Despite the battle suit’s bulk, Curtis is able to maneuver the armor as though it were weightless. This is because the inertia winder that has been incorporated into the armor. Like the inertia winder in the heroine Rocket’s belt, the Hardware Armour’s inertia winder can absorb and store kinetic energy. Through clever modification of the Cooperative technology, Curtis discovered a way to use the winder to offset nearly all of the armour’s gross weight. Over the years, Curtis has invented a wide range of weaponry for Edwin Alva and Alva industries. He has incorporated the very best of those ideas into the Hardware armor. Many of the armaments are hand held, but the larger more bulky units can be mounted directly onto the armour’s gauntlets and/or shoulder pads. Curtis’s weapon of choice is the Omnicannon. Each cannon is a tube like device that is mounted directly onto the armour’s gauntlets. They can fire a variety of shell-like cartridges that can deliver either lethal or non-lethal payloads. The Hardware armor employs a sophisticated onboard computer. Curtis named it the Digital On-Board Integrated Electronics or DOBIE for short. This CPU controls all on-board functions of the armor and can accept both visual and verbal input from the armour’s wearer. DOBIE can rapidly process massive amounts of data stored in its databanks or from external sources. Curtis Metcalf was only 12 years old when he first gained the attention of the man would be prove to be the largest influence on his life. On a lark, Edwin Alva attended the science fair in Curtis working class neighbour. Alva immediately recognized Curtis’ naked brilliance. He immediate set to work on Curtis’ parents. Alva convinced them to enrol him in the “Better Chance” program. The program was aimed at getting minority students into elite prep schools. With Alva’s backing, Curtis went to the best prep school in Dakota. When Curt arrived, the other students attempted to give him a hard time. They immediately knew that he didn’t come from money and that he didn’t truly belong there. But within the first couple of months, it became apparent that Curt was different. In weeks, he proved he was smarter than them. In months, he proved he was much smarter than them. He graduated from the prep school by the time he was 14. He went on to receive his first college degree at 15. Alva was present for it all. He paid for Curt’s college education, seven degrees in total. In the end, he offered the youth a job when he completed school. Curt started working at Alva Technologies, “the Inspiration Factory”. He received his own lab, a massive salary and the freedom to investigate and create whatever tickled his fancy. Curt made good on his half of the bargain. His inventions alone made Alva millions upon millions of dollars. And in Curt’s eyes, he had won the respect, admiration and friendship of the man who had made such a difference in his life. Over the years, Curt’s value to the company rose sky high. Therefore, he assumed that he deserved a share in the overall profits that his work had created for the company. Moreover, he assumed that he was being groomed to take over for his benefactor once Edwin decided to retire from the daily toil. He could not have been more wrong. When he broached the subject, Alva shut him down brutally. After telling Curt that he was merely an employee and a cog in his machine, he compared the situation to his pet complaining about his living conditions. Embarrassed and enraged, Curt decided to get back at his former hero. He initially tried break his contract with Alva Technologies, but found it was iron clad. Afterwards, he decided to dig into Alva’s past. Curt sought to gain enough leverage over his employer to force him to release him willing from their contract. What he found shocked him. Alva had serious connections with organized crime. He was involved in money laundering schemes, bribed government officials and was illegally manufacturing and selling weapons to foreign governments. Curt decided that blackmailing Alva would not be enough. He needed to stop him. Curt gathered copies of all of his evidence and sent it to anyone who would listen: the FBI, SEC, the police, newspapers, even television shows. Then he sat back and waited. Imagine his surprise when nothing came out of it. Nothing. And then he finally understood. Alva was untouchable. No one would dare to go against him. With that Curtis went to work. He used stolen pieces of Alva’s own technology and created a high-tech suit of armor. Metcalf then executed a series of guerilla attacks on Alva’s holdings. Calling himself Hardware, he disrupted operations, destroyed equipment and property. To his eventual shame, Hardware murdered dozens of Alva’s personal guards in his attempts to get back at Edwin. It is during this time, early on his career, that Curt came to the attention of another influential man within the city of Dakota. Augustus Freeman came to Curtis with a unique problem that only he could solve. Augustus gave Curtis fragmented pieces of alien technology that were badly in need of repair. It hasn’t been revealed exactly how Curtis reacted to the fact that one of the most influential black men in Dakota City was secretly an alien. But in any case, the puzzle of his technology was too much for Curtis to resist. He agreed to keep their dealings a secret and to try to repair his technology. The only payment he asked for, was to keep some of the technology for himself. Curt’s battle with Alva continued for many months. He faced many hired assassins that were sent to kill him, such as Reprise. Some were absolutely psychopaths, the others were well meaning individuals who truly thought Curt was a terrorist and villain. Curt defeated them all, one after the other. But eventually the number of deaths that he had caused during his one man war began to take a toll on his soul. Therefore, he made the conscious choice to no longer kill. Moreover, his crusade would no longer be about taking vengeance on Alva out of pride, but that instead it would be a quest for justice. Curt eventually found himself fighting for causes other than his own. He was recruited to fight alongside Icon and other heroes during a “Shadow War” that risked not only all the lives in Dakota, but around the entire world. In a moment of insanity, Curt risked his own life to preserve that of every other human being on the planet. In doing so, saved the entire human race from the plot of a mad man. Eventually, Alva discovered Curt’s extracurricular activities. Alva confronted Metcalf alone within his secret layer. Curt was shocked at seeing his enemy waiting so brazenly within his hideout. Hardware prepared for their final confrontation when Alva did something Curt would never have expected. He essentially gave up. Alva revealed to Curt that his actions had cost him untold millions of dollars. But more than that, he had truly impressed him with his ingenuity and courage to take on Alva and his organization. He then went on to reveal that he had been looking for a way out of the agreements he had made with S.Y.S.T.E.M and its criminal organization. Alva said that Curt had showed him a way. He then played his trump card; he made Curt the very offer he had yearned for since he first joined Alva’s organization. 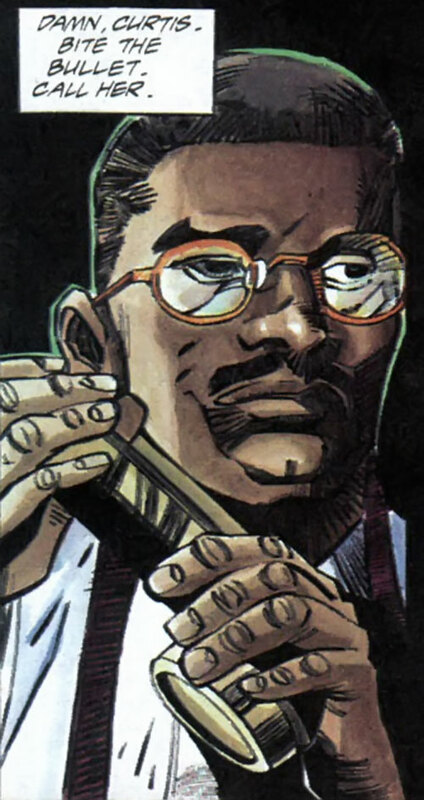 In exchange for Curt’s protection and his occasional assistance, he would promote Curt to his second-in-command and allow him to dismantle Alva’s ties to organized crime. Initially suspicious, Curtis thought about the deal but eventually accepted it. The two made a pact of loyalty to one another. With Alva’s renewed backing, Curt made modifications to his armor, making it more efficient and even more powerful. Soon thereafter, Curtis was caught up in the machinations of a confused postal worker named Fred Bentson. Bentson’s awesome power to travel dimensional space was growing to levels he could no longer control. His uncontrollable abilities first opened a portal between Curt’s dimension and another, and eventually began to merge the two. To Curt’s shock, the inhabitants of the other dimension were fictional characters from the comics he had enjoyed in his youth. He encountered the entirety of the “Superman Family” including the armoured hero Steel. As Bentson’s power caused him to descend into madness, Curt combined his brilliance with that of Steel and the raw power of Icon, Superman and Static to stop Bentson and seal the dangerous rift between their worlds. In the months that followed, Alva lived up to his end of their bargain. He began to divest himself from his criminal operations and holdings. Meanwhile, he trained Curtis in the intricacies of running a multinational corporation. To his pleasant surprise, Curt found himself with a great deal more free time. 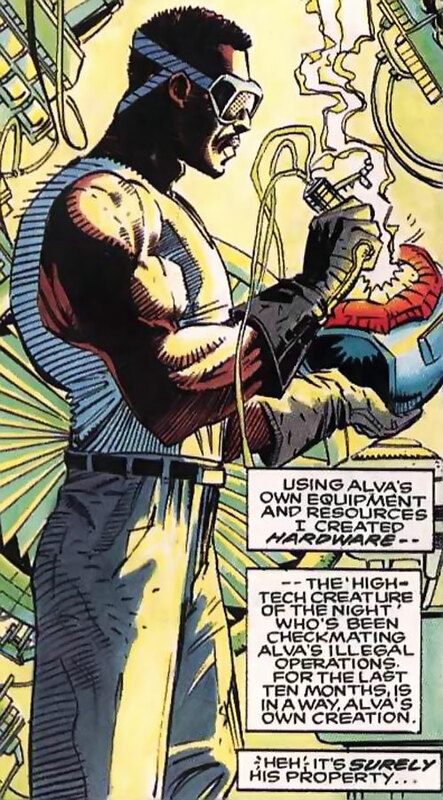 “Hardware’s” nighttime activities had dropped off due to his agreement with Alva. With nothing better to do, Curt turned to an often neglected project that he had taken on a while ago; Augustus’ communicator. He set to work on it in a moment of boredom, and while his mind wandered he had a breakthrough. Without actually meaning to, Curt fixed the alien communicator and had summoned members of the Cooperative to earth. When the aliens arrived, they initially mistook Curt for Augustus. But he misunderstanding turned out to be a brief one and before long, Augustus was on his way home. Curtis eventually gained control over Alva Industries during the riot that ensued during the opening of Utopia Park on Paris Island. The violence that occurred was due to a confrontation between park officials and those that were forcibly relocated by the creation of the park. 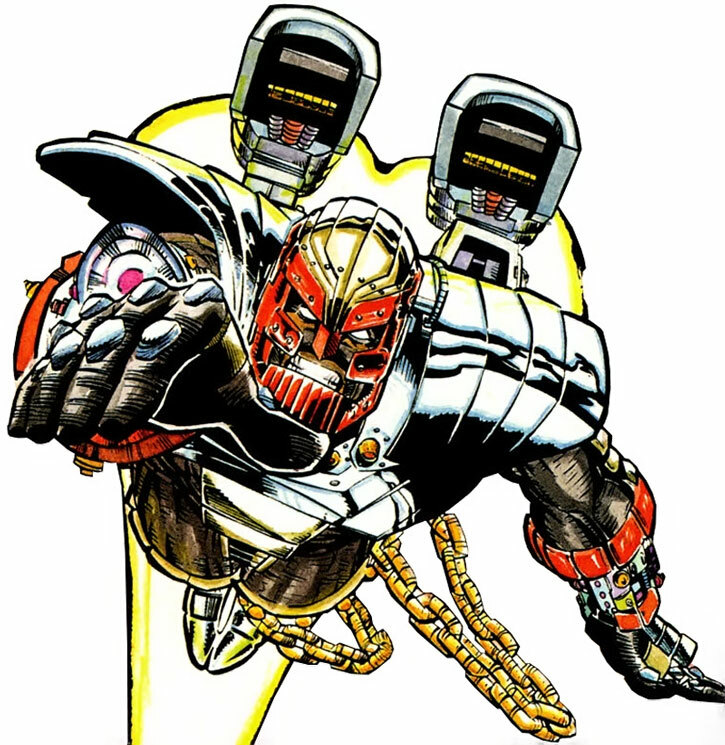 Alva, inspired by Curt’s example, donned a suit of prototype armour in order to help quell the violence. But he was crushed to death when he attempted to save a group of people from falling debris. Curtis is an average-looking African American male. He keeps his hair and thin moustache immaculately trimmed, and has a fit yet slim physique. The outer layer of his Hardware armor is an all black shell that covers Curt from head to toe. This layer completely obscures his features and includes a opaque film over his mouth and his eyes. On top of that layer sits a silvery metallic layer that covers his shoulders, the majority of his torso, and portions of his legs and arms. The current iteration of his armor (Version 2.0) covers a greater surface area of the primary layer to afford Curt with best possible protection possible. It is upon this layer which his weaponry is mounted. Finally, Curt wears a thick helmet which covers the entirety of his head but leaves his face relatively unobscured. It is highlighted in red, and has thick red metallic chin and nose guards. Initially, Curtis was what one would describe as a stereotypical “angry black man.” He was rude, and flippant. He had an enormous chip on his shoulder that he practically begged and dared any and everyone to knock off. As Hardware, he was brutal in both his execution and efficiency of anything he tasked himself with. He would always take the quickest and most effective manner of dealing with any obstacle. If that meant murdering or dismembering security guards or destroying a city block, then he would do so. As he matured into his role as a “superhero,” Curt’s conscience grew. He experienced genuine feelings of guilt over his past actions and murders. He resigned himself to making up for the loss of life he caused, and resolved that his future actions would only be in the cause of justice instead of personal vengeance. He grew even further after his encounter with the hero Steel, who taught him that while the means can matter equally as much as the ends. 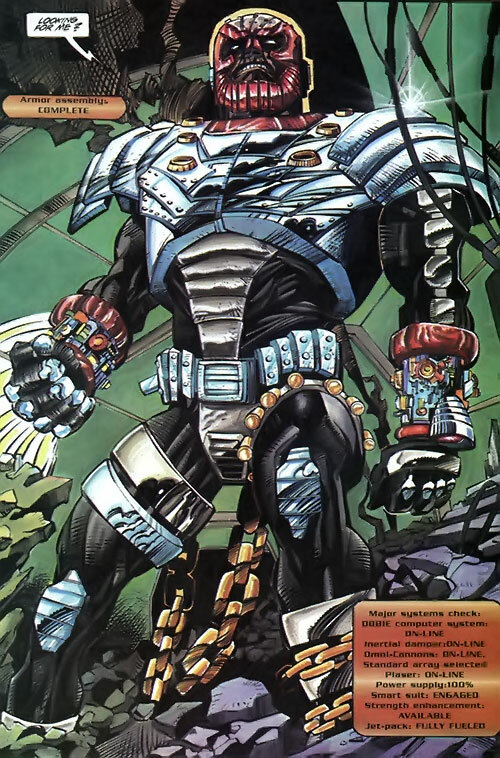 With this in mind, all of the events of Hardware series actually occurred in the DC Universe, and that Hardware himself could be encountered by a group of player characters through the clever application of the Dimensional Travel power. 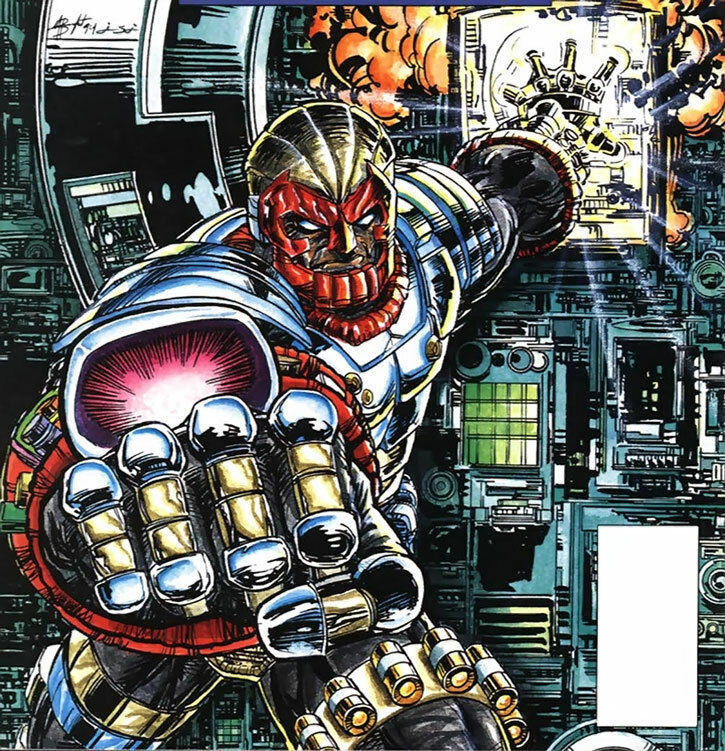 After the events of the Infinite Crisis and the New 52, the characters of the Milestone Universe have been folded directly into the DC Universe, and Dakota city is presumed to have been always present. Genius, Expansive Headquarters, Scholar (Computer Software, Power Armor Design, Weapon Systems). Edwin Alva (High), Harm (Low), Icon I (High), Static (Low), Technique (Low). HARDWARE SHELL VERSION 2.0 [/STR/ 06 /BODY/ 07, Accuracy (Armor Weaponry): 09, Comprehend Languages: 10, Flash: 06, Gravity Reduce: 03, Power Reserve (STR): 02, Radar Sense: 08, Radio Communications: 18, Sealed Systems: 08, Skin Armor: 03, Sonar: 08, Thermal Vision: 06, Artist (Actor): 10, R#02. Bonuses & Limitations: Hardened Defences, Flash: Illumination Only, Gravity Reduce: Always On (Affects Armor only), Power Reserve: For each round active, add 01 to Armour’s R# (cumulative), Skin Armor: Partial Protection Only, can be bypassed with a Trick Shot]. D.O.B.I.E (Digital On-Board Integrated Electronics) [INT 10, Recall: 25, Scientist (Computer Science): 10, Thief (Security Systems): 08, R#01]. ENERGY SHIELD [BODY 06, Force Shield: 06, R#03]. JET PACK [BODY 06, Flight: 08, R#01]. Armor Piercing Shell [BODY 02, Projectile Weapons: 05, Sharpness (Projectile Weapons): 03, R#01]. Bolo Shell [BODY 02, Snare: 08, R#01]. Explosive Shell [BODY 02, Bomb: 08, R#01]. Flechette Shell [BODY 02, Projectile Weapons: 05, R#01. Bonuses & LImitations: Area of Effect]. High Explosive Armor Piercing Shell [BODY 02, Bomb: 08, Sharpness (Bomb): 03, R#01]. Knock-out Gas Shell [BODY 02, Knockout Gas: 06, R#01]. Neural Net Shell [BODY 02, Paralysis: 08, R#01]. Stun Shell [BODY 02, Flash: 08, R#01. Bonuses & Limitations: Affects both sight and hearing]. P.L.A.S.E.R [BODY 08, Energy Blast: 12, R#01. Bonuses & Limitations: Ammo: 03, Area of Affect (03 APs), Lethal, Non-Variable]. Plasma Whip [BODY 08, EV 06, Lightning Being: 08, Sharpness (EV): 02, Stretching: 01, R#02. Bonuses & Limitations: Stretching has No Fine Manipulation; the defensive bonus of Stretching is only applicable to the Whip itself, use of Lightning Being increases R# by 1 per round it is in use]. RETRACTABLE SWORD [BODY 07, EV 04, R#02]. 8 AP C Omni-Gadget (x2). 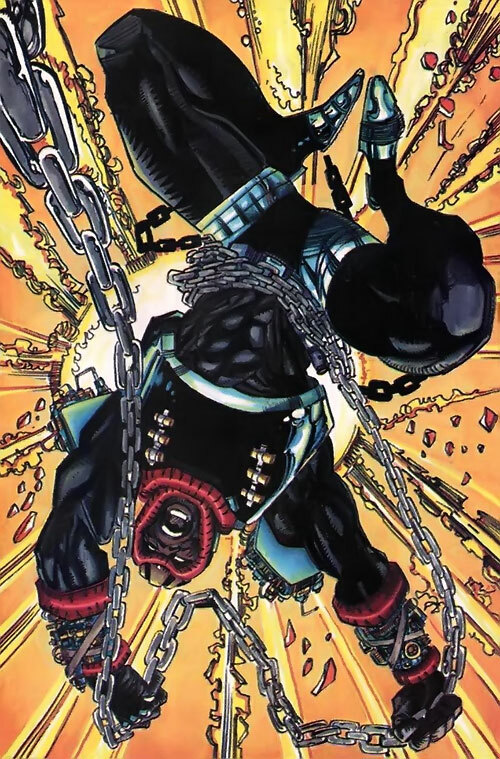 Source of Character: Milestone Imprint Series – Hardware, created by Dwayne McDuffie (Writer) and Denys Cowan (Artist). Writeup completed on the 31st of December, 2012.